Today, I completed this stitch sampler. Added a few more samples. 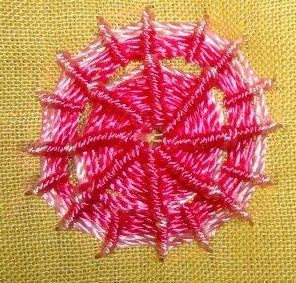 10 –I stitched sixteen straight stitches in this circle, while working around, alternated between whipped wheel stitch and woven wheel stitch. 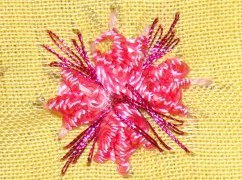 It does not look any different from the normal whipped wheel stitch. 11 in the first sample, I added pink beads to the whipped wheel stitch. I tried working this stitch in oval shape. 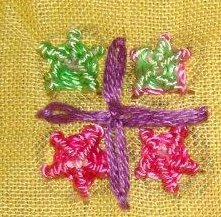 12. the first stitch is worked in hexagon shape with a pink stone in the middle. The next one is worked in square shape with a bead in the middle. 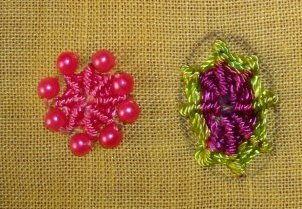 This week’s stitch of the TAST 2012 challenge is barred chain and alternate barred chain. I had worked this stitch during the rerun of the first TAST challenge. Now have to think about some new variations of this stitch. 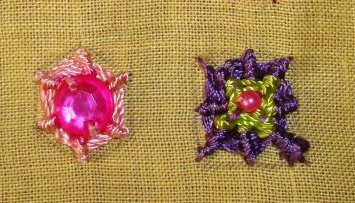 A few more motif variations with this whipped wheel stitch. 6- four whipped wheel stitches with five spikes worked to form a motif with detached chain stitches. 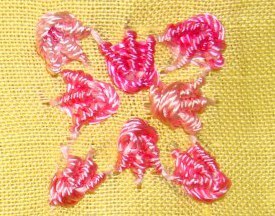 7- whipped wheel stitch worked in variegated thread, outlined with detached chain stitches. 8- again used variegated thread , this time outlining with zigzag stitch. 9- in this sample extra spikes are added around the circle. I did a few more variations of this week’s stitch. I tried this stitch in a line with other stitches. 2- first row , a variation of whipped wheel stitch is worked on a row of herring bone stitch. 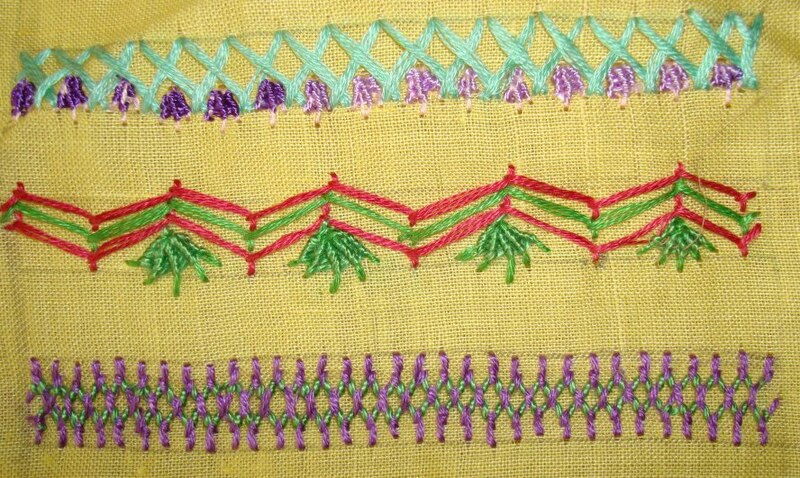 The second row is with three rows of Cretan stitch. Third row I tried whipping a row of double Cretan stitch. 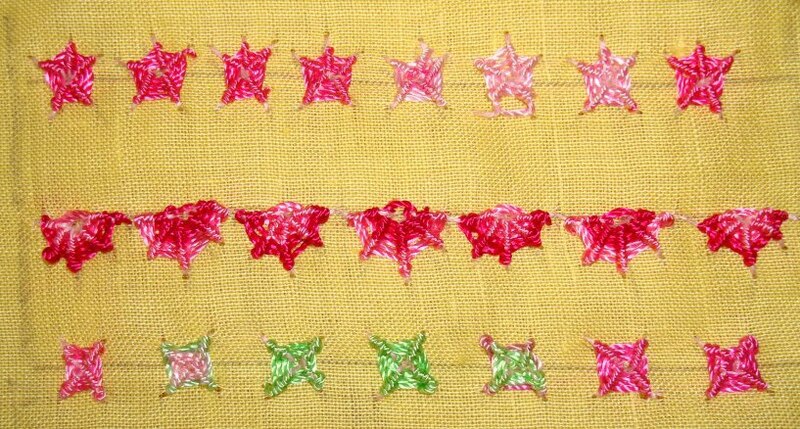 After this I am using this stitch to form some motif patterns. 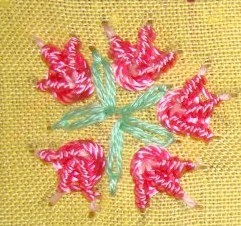 3- five individual variations of whipped wheel stitch with three spikes, combined with detached chain stitch. 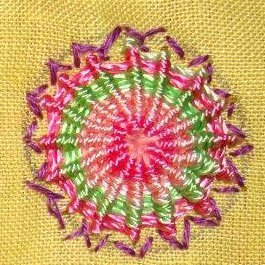 4- four whipped wheel stitches with three spikes combined with straight stitches worked in metallic thread. 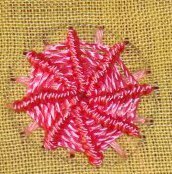 5-this motif is made completely of three spikes whipped wheel stitch. I am starting this week’s TAST 2012 challenge stitch a bit late. This stitch was worked as a sampler during the previous TAST challenge. It was posted here. First thought I’ll skip this stitch this time around. But today thinking of working at least a few samples. 1-the first row is worked with five spikes. 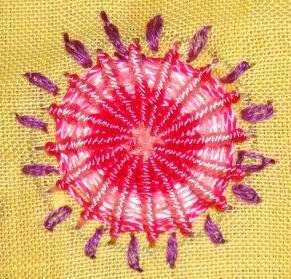 The second row is done as a semicircle with dark and light pink thread. The third row is done with four spikes. Still working on this sampler, will see what it brings!